From the Beginning in 1960 We Have Made Tremendous Progress…. Bob-Jo Speedway started as a go-cart track in 1960. 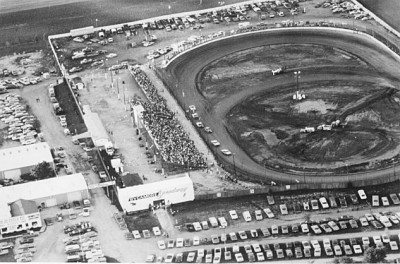 On May 30, 1963, Bob-Jo Speedway ran its first stock car race ever. The lighting for the track was finished about 5 minutes before it got dark and the last bleacher board was put in place at 6 p.m. We had outhouses for bathrooms and the ticket window had no lights. After it got dark, we sold tickets by flashlight. The men had not slept in three days and every penny we owned had been spent to buy hot dogs and buns to sell that first night. The good Lord was with us and about 800 people bought tickets to see the first stock car race. Adults cost $1.50 each and Children were $.50 each. 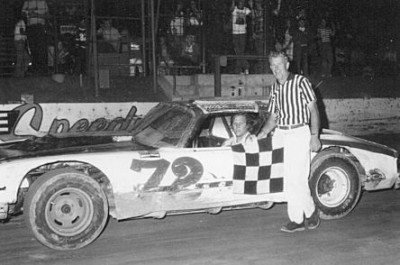 With the 1966 season in full swing, once again stock cars highlighted the field on Friday and Saturday nights: A woman’s group “the Speedettes” was organized by Brenda Nevitt. They were very active and made sure the women had equal rights as early as 1966. 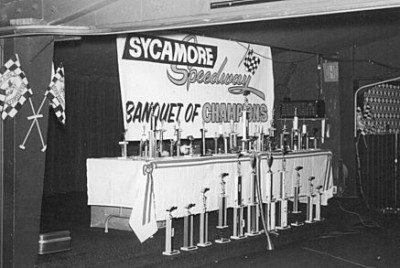 In 1970, Bob-Jo Speedway officially changed its name to Sycamore Speedway because of the nearness to the rapidly growing town of Sycamore. A beer wagon was built and a liquor license obtained. The 1970 race season featured Late Models, Socker Stockers (6 cylinders) and Motorcycles. It was also the first year for the “Old Milwaukee Classic” 40 Laps! In 1972, the ticket/office building was constructed at the main front entrance, to accommodate the growing needs of the Speedway. As the 1978 stock car racing season got underway, new improvements had been made to upgrade the sport of racing. An all new lighting system had to be installed. Three new 80 foot poles were erected, sixty 1500 amp lamps were attached and a 600 amp electrical service had been put in. All this lighting presented a shadow-free course on a superbly lit oval. A new retaining wall was built at the #3 and #4 turn of the inner track, and a complete new drainage system added. Lake Sycamore, famous for dunking unsuspecting drivers, is now just a memory. The new motorcycle T.T. track was put in the center of the infield to complete our racing facility for the many kinds of racing that the Speedway had planned for the season. In 1979, we started a new drivers division called the Spectator class, where anyone that has a car can have fun racing. Welcome to the ‘80s! A new decade of thrills and spills at, the Sycamore Speedway with the Super Late Models, Lo Buck Late Models, Spectators, and Powder Puffs opening the season on Saturday nights. In 1980, a new entrance from Hwy 64 was built which was well lit and marked to welcome all drivers and fans. In 1981, we created an event especially for the Spectator division. Once a month on Sundays, the Crash-O-Rama was held offering Crazy B’s, driving in reverse and our first Demolition Derby. In 1992, we added lighting to the parking lots, 7 light poles with 28 lights to make a well lit parking area for our race fans. In 1995, the bottom concession stand caught fire and burnt to the ground because of a groundhog looking for a warm place to hide in the winter. This was an unexpected improvement to the bottom concession stand. As the years pass by, our lives have changed and everything around us has changed as well. In 2000, we built a new track wall which was 37 years old and starting to curve inward. This was an all winter project. The 2001 race season was our roughest season ever. The owner and original founder, Joseph Fabrizius, was hit by a flying tire on practice night, April 21st, 2001, which caused his death on April 25th. Our opening night, of April 28th was canceled due to the funeral. It was really a rough start for the year but everyone; family, friends, and business associates all pulled together and we made it a successful year. In 2002, we built a new outside bar, souvenir stand, and photo booth all in one. It eliminated the three old buildings behind the bleachers, which were originally built in the 1970’s. In 2003, we updated to the 20th Century with our very own website, www.sycamorespeedway.com. Now you can go online and find everything you need. On March 1st, 2003, one of the other owners Nick Fabrizius, Joe’s brother, was taken from us due to illness. In 2004, we started the Joe/Nick Memorial Classic race in June in honor of the two owners who God took before their time. This has become our most special night at the track in honor of two great entrepreneurs. The laps for this race increase by one every year based on the number of years the track has been open. Also in 2004, we started a new division of racecars, called the Compact Combat. These are compact cars that race on Friday and Saturday nights. In the spring of 2005, we added a lighted scoreboard on the backside of the track that displays the top 3 cars in every lap. The winter of 2005 and spring of 2006, was a very busy time. Due to mild winter months, we were able to make several improvements. We raised the front fence in front of the grandstands, an additional five feet for everyone’s safety. The original pit shack from 1963 was removed and put to rest. The old popcorn stand now is being used for storage. In 1963, it cost $3.00 for a pit pass and a fee of $4.00 nightly if you did not wear white pants. Things sure have changed in 2014, a pit pass costs $30.00 and there is no white pants fee. 2010 started off like every other year, fighting the weather while providing good ole entertainment. Half way through the season the next generation, eager to continue fun filled weekends, took over management, with great intensions of keeping racing fun for both drivers and fans. As the 2011 season went underway, the winter months were busy working on revamping our entire rulebook, as well as adding a scale for the cars. The infield of the track was emptied and cleaned for the Figure 8 and Demolition Derby pit. The Figure 8 race will now be held in the infield along with the infamous Friday night Demolition Derby. 2011 provided a lot of first for Sycamore Speedway. In May we were picked as a location for the movie “At Any Price” directed by Ramin Bahrani with actors Zac Efron, Dennis Quaid, Heather Graham, Clancy Brown. Throughout the summer we were a part of various movie shoots and we ended the season with a weekend filled with Movie Making. A lot of our drivers were picked for action and pit scene shots. A ton of our fans were picked for the crowd scenes and our staff was put to work helping make this all possible. It was a lot of hard work but definitely made lasting memories. In preparation for 2012, our winter and spring was busy filling up our schedule with a lot of special events. We thought there was nothing better to do to keep racing fun and alive then to go back to our roots. With that we added Midget Racing and Motorcycle Racing to the schedule. The 2013 race season brought us to our celebration of the 50th anniversary of family entertainment and racing fun. To celebrate we hauled in over 100 loads of blue clay and reworked the banking and race surface. It added to the chills and thrills of the Midwest Finest Action Clay Track. We replenished the shade to the Spectator, Powder Puff & Compact Pit Area and dug the pond a little deeper to ensure plenty of water for the upcoming season. For our 50th anniversary we found it fun to do a Blast from the Past and brought back some races and classes that we used to run in years past. Now with 50 years of racing under our belts we are more excited than ever to continue providing family fun entertainment. As you have read a lot of changes have come to Sycamore Speedway over the years. We are very pleased to announce the continuation of moving forward in the racing industry. During the 2014 race season Sycamore Speedway will be the hosts to many new forms of racing. The Spectator, Compact Combat, Powder Puff, Late Model, and Super Late Model divisions that we have seen for so long are now not the only divisions of racing at Sycamore. We welcome our new division and drivers, the Modified Compacts and the 4-Bar SuperLate Models. The requirement to use race receivers for all 4-Bars, Super Late Models, and Late Models will continue to make our nights run smoothly with as much action as possible. As you glance off to turn 4 and the track entrance you may recall a small shack on stilts, our pit tower. Being older than most of us the tower was ready for an extreme makeover. A new building was constructed to provide a better place for drivers meetings, qualifying drawings and a driver’s headquarters. We also extended our schedule, the fans spoke and we listened. We added 2 more Friday nights to the schedule so you can enjoy the Demolition Derbies and Figure 8s. Our Super Late Models & Late Models will have an extra week of racing as well. Since 2011 we have been working very hard to bring Sycamore Speedway into current times while holding onto the nostalgic atmosphere that has kept us thriving for 51 years, 2015 will be no exception. In 2014 many of you saw a new website that offered a variety of information never before included such as FAQs and driver profiles. We also dabbled in running Fantasy Racing. The new interface of the website will allow us to continuing building our website so maybe one day we can offer video of our races and let our fans from afar watch. As the season drew to a close, we tore down the old pit shack and constructed a new one. The old days of our drivers hitting their heads on the awning are long gone. During the off season we continued to stay busy getting ready for the 2015 season, we added a brand new class called Pure Stock and formalized the class of Modified Compact. You will see these classes on Saturday nights, both classes offer affordable racing while allowing drivers an opportunity to “set up” their racecars. In 2016, we launch the Sycamore Speedway app. 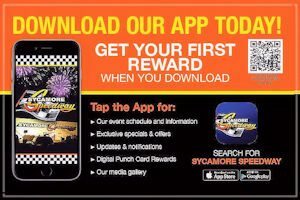 You can find this by searching Sycamore Speedway in either Google Play or the App Store, it is free to download and provides drivers and fans with up to the minute notifications as well as much easier way to view our schedule, you can also find some coupons to use too. 2017 is going to a be a season is going to be historical for a couple reasons, the biggest being on June 16, 2017 we hosted our 1st ever Summer National UMP Hell Tour Show. 38 Dirt Late Models & 10 Summit Modifieds took a chance on a little dirt track most had never heard of, and filled the pits with double decker stackers and put on a phenomenal show. Billy Moyer took home the feature win for the Late Models & Nick Hoffman was the feature winner for Summit Modifieds. In 2018, we raced with Mother Nature more times than we wish to mention. She took many checkered flags this summer but we still held true to what we promised our fans and that was summer entertainment. This was the season of the least number of shows but the action was from that. Many close finishes and in fact a dead tie at the finish line, something I don’t think any of us have ever witnessed. We wish to thank you for all the continued support over the last 55 successful years and for allowing us to be your choice of summer entertainment. As we start our 56th season we hope that 2019 is a season for the history books with lasting memories of racing and entertainment.